The Africa area perches on Cedar Mountain’s northeast side. There’s more vegetation and shade in summer, consequently more snow in winter. You can spend all day or several days moving from boulder to boulder across the entire slope. Africa sits above the Mid-Mountain area giving you practically unlimited routes in a relatively compact area. This spot takes its name from the Africa Boulder, the largest in the group at about 30’ high. The flake on the eastern side is shaped something like the continent, hence the name. It’s a fairly easy 10 minute hike into Africa from the parking lot. There are two ways to access the area. From the car you can hike straight across the slope into Mid-Mountain then take the trail uphill to Africa. Or from the parking area take the first left-hand trail uphill to the talus slope. You’ll have to boulder hop across the scree but you’ll come out at the top of Africa. Either way, Africa Boulder itself is pretty apparent. Just past the parking area you’ll be at the top of the draw and the entire slope with its enticing boulders and routes appears before you. Africa will be to your left, Mid-Mountain right and downhill. One of the more popular boulders within Africa is Spear Point. 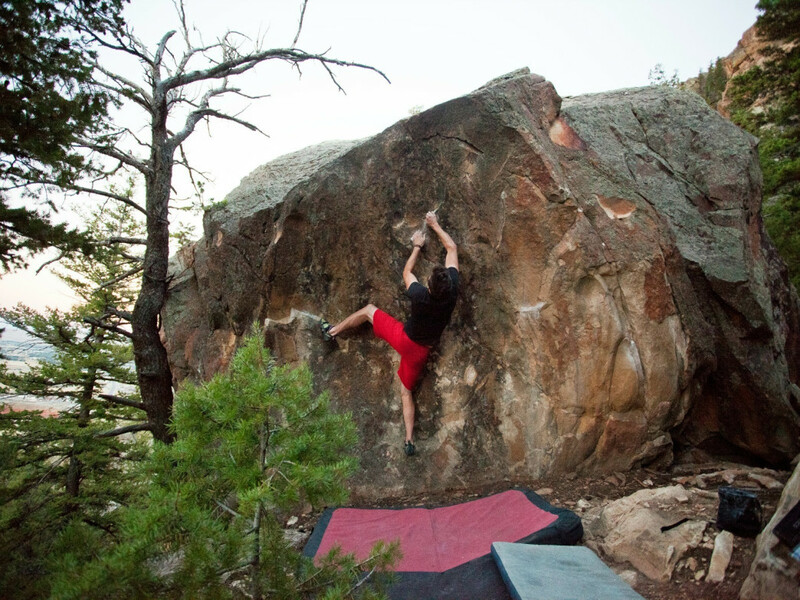 Spend all day here on this south-facing rock working V3-V7 routes. This rock is fat with crimpers, pockets and jugs. 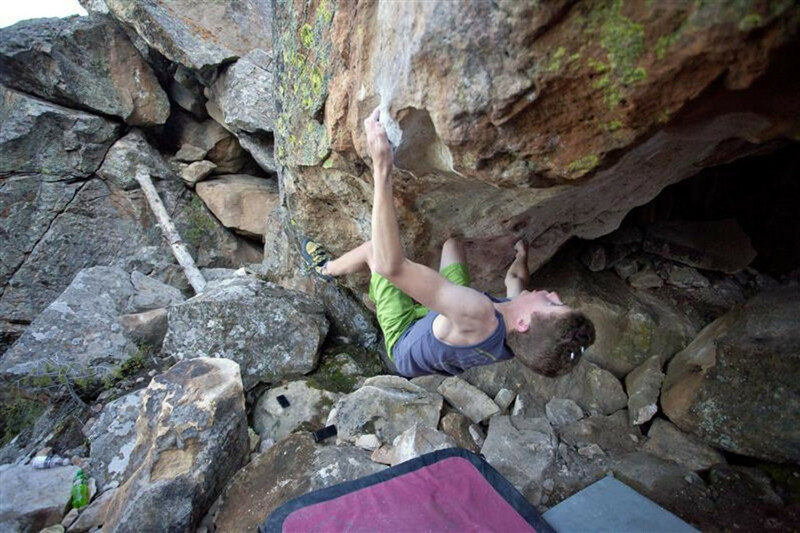 Africa has one trad climb with anchors for a top rope on the 35’ tall Y boulder. This isn’t a very safe route for bouldering. If you didn’t bring gear, don’t attempt it. Due to the expansive nature of Africa and its flow down into Mid-Mountain and on to the Maze, there’s something here for everyone. This is a great spot for beginners as well as experienced climbers. Groups can spread out so even if there are lots of other people enjoying the rocks, it won’t feel crowded. Routes in Africa call for strong, powerful moves that you crank out in quick succession. The area is low enough on Cedar Mountain that you can easily pack up and return to Cody for lunch and a rest, then head back up for some afternoon climbs. These sandstone boulders tumbled down from the top of Cedar Mountain, sometime in the very distant past, reminding climbers of the volatile nature of this area just 50 miles from the Yellowstone Super Volcano. From Cody, take US HWY 14/16/20 west 3.9 miles to the Cedar Mountain Trail Ride turnoff. Continue up the road to the left past the immediate small parking area and then the next larger one. Drive to the 4th switchback - you’ll see a relatively flat, decent sized parking area that’s well-used. Take the trail from the parking lot due north and follow the directions above to access Africa. There are no fees and leashed pets are permitted. Note that there’s no water and no bathrooms on Cedar Mountain. Watch for rattlesnakes.